After quite a bit of hype, Detroit’s new hockey/basketball/concert/entertainment venue, Little Caesar’s Arena, opened this fall. The reviews were mostly positive, discussing wide concourses, great food and beverage selections, and incredible sight lines. 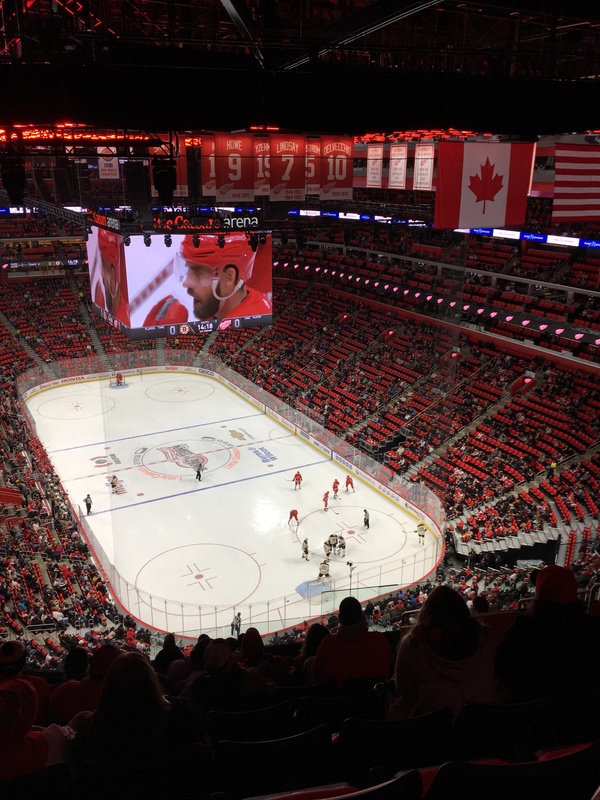 There were only a few knocks on Little Caesars Arena, or “LCA.” The seats were very steep, it’s more of a hockey arena than a basketball arena, and the venue seemed empty during the action due to team struggles and the vastness of amenities. I had been to the famous Joe Louis Arena a few times, and I enjoyed the character of an old hockey barn a year older than me. It actually reminded me, slightly, of the old Boston Garden I grew up with, with few amenities and great sight lines. I had also been to several basketball games and concerts at The Palace of Auburn Hills out here in the suburbs. I loved that the arena was close to our house, but there was no public transport to get there, and basketball games were largely empty. And despite being revolutionary at the time of its construction, I was disappointed with the acoustics when I saw Adele. Adele was outstanding, but even SHE had to fight some of the acoustics at The Palace. 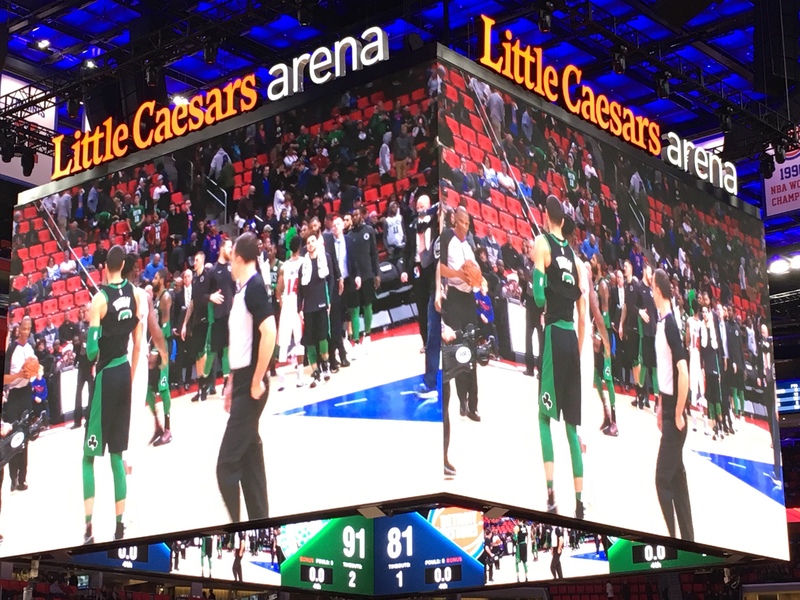 As the schedules would work out, I made my first two trips to the new arena in a span of 4 days – as my Celtics visited Sunday afternoon, followed by my Bruins Wednesday night. Let’s review, chronologically. I was a bit concerned about parking on a cold Sunday afternoon, so I reserved parking ahead of time, in a lot a few blocks away, through an app called ParkWhiz. For $20, it seemed quite reasonable. We were disappointed, however, in the fact that there was no designated area to cross Woodward Avenue north of the arena. The venue itself was gorgeous. We made a lap around the lower bowl’s concessions area. The staff was extremely friendly, and I ended up settling on a Gentleman Jack and coke from the Jack Daniels cocktail stand. There was a plethora of Michigan Brews, although I was a bit disappointed to see that Goose Island had a stand. I found it surprising that the Ilitch family would sell real estate to a beer so closely associated with Chicago, the Wings’ biggest rival. The food selection was great – we bypassed Kid Rock’s grill, but I did grab a giant Little Caesars slice (at $6 it was the cheapest food item I could find). My wife grabbed some chicken tacos that were solid. 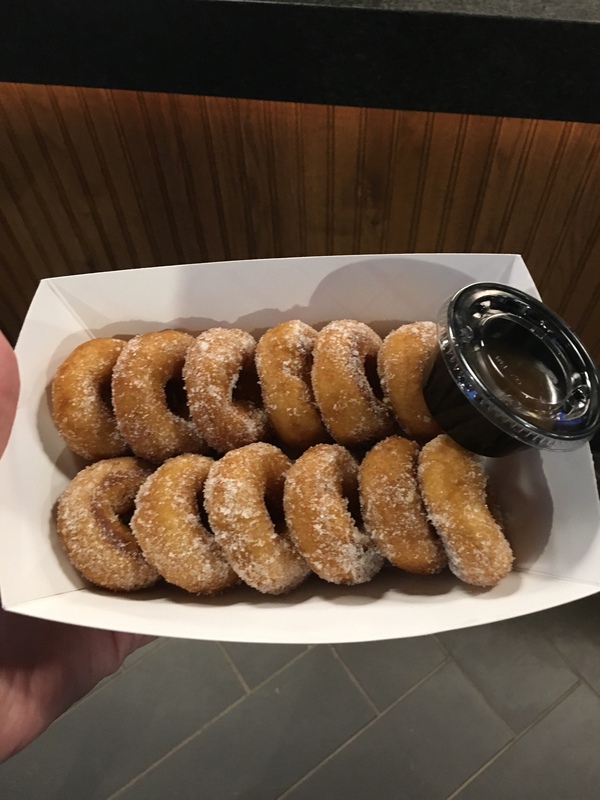 And we split the mini donuts and dipping sauce, that were as tasty as they look. We splurged for some solid seats to see the Celtics (my wife went to a ton of C’s games growing up). For about $100 each, we were just beyond the hockey boards, with a great view. The first thing we noticed was the incredible sound system in the arena. I’m actually a bit embarrassed to say it wasn’t me, the 15 year radio veteran, that noticed it first. It was actually Ellen. We quickly decided we need to see a concert at the new LCA. The giant scoreboard was equally impressive and informative. The inner “layer” was great for those in lower seats. During the game, there was a running display of every player on the court and the number of fouls he had. Very impressive. 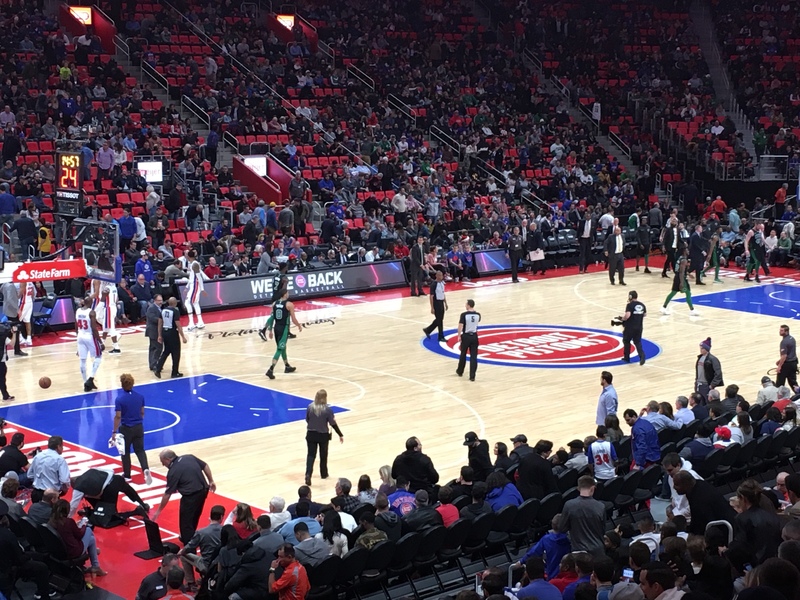 While Little Caesars Arena is more of a hockey venue, it’s just fine for a basketball game. That leads us to the ice later in the week..
Wednesday night saw 7 inches of snow that started midday and came down hard and fast during the afternoon commute. Combine that with a struggling/rebuilding Red Wings team and we knew we wouldn’t have a large crowd. But we piled into the 4×4 and headed downtown. This time we parked in the Fox Garage for a reasonable $25, and didn’t have a bad walk to the arena, from a couple blocks south. This time, I was planning on dinner, and an item I’d mentally bookmarked on Sunday. 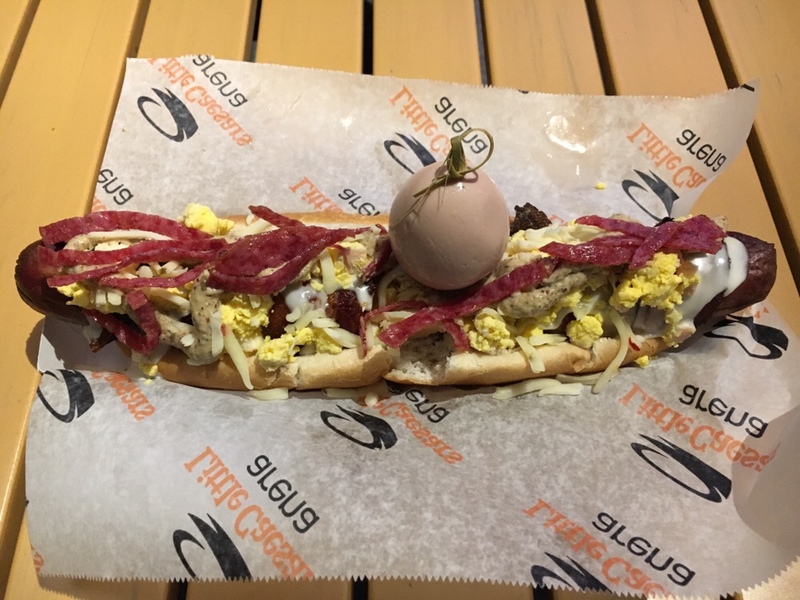 The menu board described this monstrosity as a “1/2 lb Bacon Wrapped Pub Dog, with crispy salami, white cheddar, pepper jack, mustard, and a pickled egg.” It took a good 10-15 minutes for the (friendly) staff to make this, and I had to eat it on a nearby table. There was no way I was going to eat this in an arena seat even with a cup holder. I got through about 2/3 of it, before it completely fell apart. The egg was a nice addition. The entree was a novelty, but not something I’d get on the regular (unless I found a good cardiologist). We then headed up to the second level, with more solid food offerings, and eventually to our seats. We paid $40 each for tickets at the top, top, top of the arena – super steep but great views once we got settled. In fact, I suggested to my buddy that we move down into the empty seats, but he wanted to stay put because we had such a great view of the action! I would also be remiss to not give credit to arena organist Lance Luce – who did a phenomenal job all night, including getting the crowd in the holiday spirit. The Wings outplayed the Bruins but managed to give up a late game-tying goal, allowing Boston to force overtime. I made a quick bathroom run, forgetting how short the break is between the third period and OT. I came back into the section during play, and as luck would have it, the Bruins game-winner 30 seconds in. So, I saw it, but not from my actual seats. We left the arena, and it took us awhile to get out of the Fox Garage (as we were on level 5). All in all, it was about a 30 minute wait. It felt longer due to the late game and weather, but it wasn’t bad. This criticism of Little Caesars Arena is fair; LCA is better suited to hockey than basketball. It FEELS like a hockey rink. That’s not surprising, given that the Ilitch family (who owns the pizza chain, Tigers, and Wings) built it for hockey. The Pistons were convinced to move downtown after the arena was designed. The “Bad Boys” have a beautiful new home, but it is indeed more suited to be home to Hockeytown. Finally, there was some discussion as to what the preferred nickname of Little Caesars Arena would be. There was the “Dough Joe,” the “Pizza-rena,” the “Pizza Pizza Rena Rena.” I also enjoyed “The D Brief” podcast co-host Mike Geeter’s suggestion of “The HARA” – the Hot And Ready Arena. In the end, most sports journalists in town seem to be going with the simple, yet boring “LCA.” I guess that will stick. Under any name, the arena is beautiful, with great sight lines, sound, video, amenities, food, and drink. It’s state of the art, and will only enhance the amazingly revitalized downtown of Detroit.